Can Champagne Help Protect Your Memory? Have Scientists Found Another Reason to Love Champagne? Researchers at Reading University in the UK have been feeding Champagne to some very lucky lab rats. They have discovered that the equivalent of three glasses of Champagne a week seems to boost the rats’ memories, and may even slow down or ward off dementia and Alzheimer’s. So far they’ve only conducted lab tests, but they are planning to start human trials soon. According to the article, they think it’s the phenolic acid found in red grape skins that is causing this beneficial side effect. The article doesn’t discuss whether or not still wines have this same effect. And it doesn’t say whether or not these are actual Champagnes, or if any sparkling wine made in a traditional fashion will do. What’s your favorite Champagne or sparkling wine? Leave a comment and let me know what I should try the next time I buy wine. 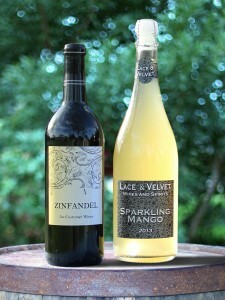 Besides the Mango, I’m partial to the Barefoot Bubbly sparkling wines. They have seven different varieties and are widely available. If you like a sweet sparkler, be sure to give them a try! Mrs. Noontime has yet to find a sparkling wine she doesn’t like. Need special custom labels for your sparkling wine bottles? Check out our waterproof, two-part wine label designs. Printed in waterproof ink on a polypropylene stock, you can leave your bottle in an ice bucket all day without ruining the label. It’s the perfect label to personalize your homemade wine for parties, weddings, receptions, or gifts! This entry was posted in Custom Labels, Gifts, Homemade Wine and tagged Bottles, champagne, Gifts, Labels, Parties, Receptions, Wedding, Wine by Noontime. Bookmark the permalink.